Clifford Maxwell Beales was born in London on 1 May 1912. After finishing his study dentistry, he set up his own practice in Woodford Green, Essex. 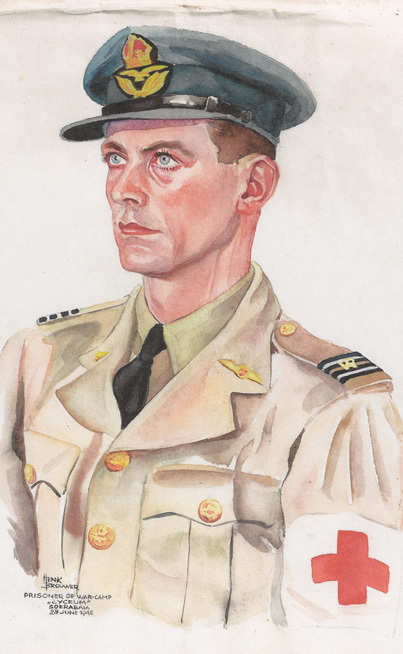 In 1940 Clifford signed up as a Flight Lieutenant in the RAF. On 8 March 1942 Beales was taken prisoner in South West Java, after his evacuation with other dental personnel from Singapore. As a prisoner of war he first remained in the Lyceum Camp, where he met Henk Brouwer. Beales was portrayed on 28 June 1942. From Soerabaja Beales was sent on a dreadful four week boattrip to Haruku Island, near Ambon and New Guinea, together with mixed British and Dutch working parties. He spent 15 months in appalling conditions, before being shipped to Ambon and another ‘hellship’ voyage to Batavia (now Jakarta). On 2 February 1945 he went on to Saigon as the only British RAF officer POW and the only dental surgeon. In Saigon he was eventually released on 7 September 1945. A Swiss member of the Red Cross looked after him and arranged for his trek home: from Saigon to Bangkok, to Rangoon, crossing India by train and leaving Asia by ship from Bombay. He arrived in Southampton on 26th October 1945. His return home after the war was difficult. He found his dental practice, like many other buildings in London, totally ruined. Furthermore, the British government had advised the POWs families not to discuss their war experiences with their sons, since this would make it harder for them to pick up their normal life. The same message was given to the returning POWs. And Beales, 35 years old by then, indeed buried his memories of these years, except at annual reunions in London or a private occasion, when he met up with men who had gone through the same experiences. Clifford Beales managed to restart his dental practice and worked until his retirement in 1977. In 1984, at the age of 65, he died of a brain tumor. The portrait of Beales was painted during the initial phase of their captivity on Java, not in Changi. This is underlined by the way he is dressed, still relatively smart, and by his looks: somewhat strained, but in relatively good health. Beales must have been pleased with the result of Brouwer’s work, since he securely kept the portrait during the war. When daughter Carol cleared the cupboards in her mother’s house in 1999, 15 years after her father’s death, she found the Brouwer-portrait of her father. It was wrapped together with some other documents. Beales had never shown the portrait to his family and his wife never mentioned them. In 2011 Carol Friend-Beales donated the portrait to the Imperial War Museum in London, and that is where we discovered it in the archives.